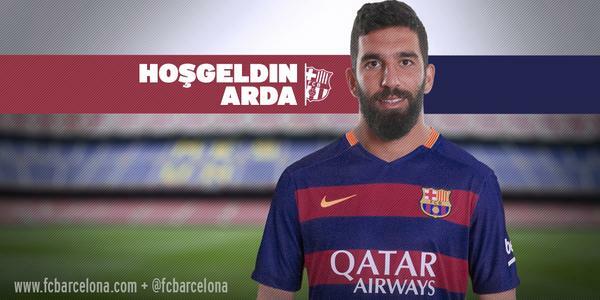 Barcelona announce the signing of Turkish midfielder Arda Turan from Atletico Madrid. Last week, the Atletico Madrid midfielder was reported to be interested in joining Chelsea but Barcelona were able to lure him to move from Madrid to the Catalans for €34m in a 5-year deak. The deal was approved by the board of FC Barcelona as they still await the election of the club's new president. Turan will only be able to play for Barcelona in January and this transfer has a clause which state that the player could be sold back to Atletico Madrid in two weeks depending on the outcome of the presidential election. The Managing Board of the Club were made aware last week of the request from coach Luis Enrique and from the favourable report from the Technical Committee that Arda Turan be brought in to form part of the FC Barcelona squad. The Committee has analysed the operation, stating that after negotiations that began months ago, there is an agreement for the signing of the midfielder with Atlético Madrid and with the player himself. Once the reports were studied, the Committee has given the go ahead to the operation. Given that the operation is taking place during the electoral process, the Managing Committee understands that given their powers, as established in the Club’s statutes, are “limited to the necessary and vital activities that allow the club to function normally and protect its interests”, it is crucial for the operation to be structured in such a way that the Club can successfully sign the player requested by the coach and by the Technical Committee whilst at the same time allowing the next Board of Directors to ratify the operation. The agreement includes the option of selling the player to Atlético Madrid for the fixed fee less 10% option costs. This option could be exercised by FC Barcelona up until midnight of 20 July if the next Board of Directors should wish so. This agreement has been ratified unanimously by the Managing Committee. The Managing Committee understands that the structure of this operation protects the interests of FC Barcelona and will respect the decision of the president that is elected by the members on 18 July.